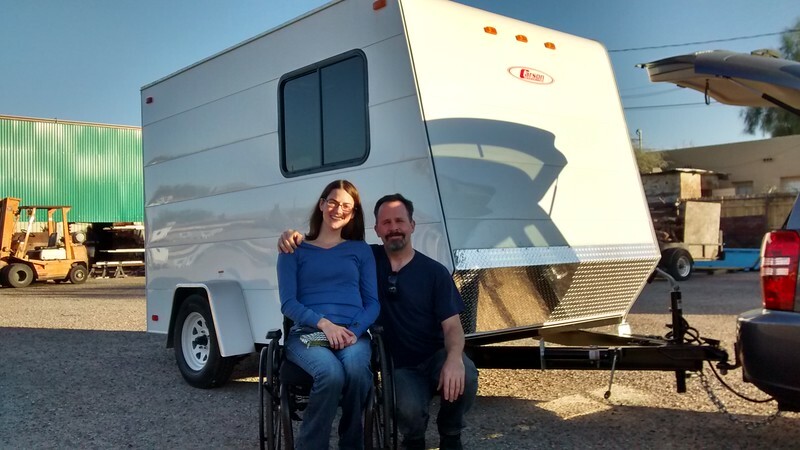 We're building a wheelchair accessible camper from a cargo trailer. 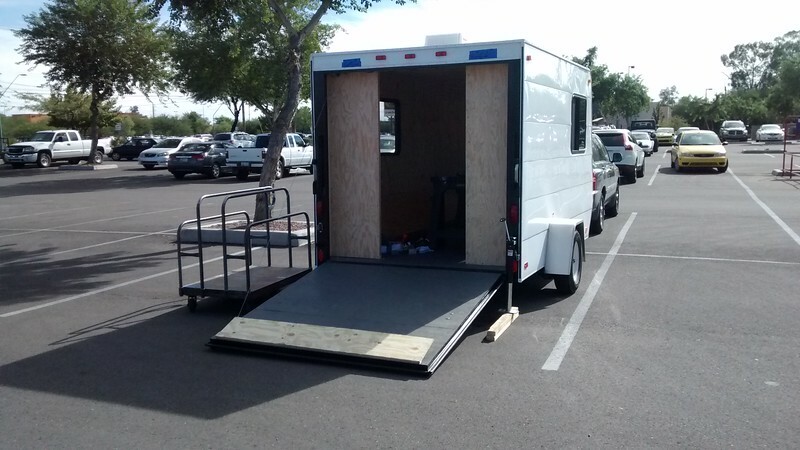 The trailer is 7' wide by 12' long with a rear ramp door. 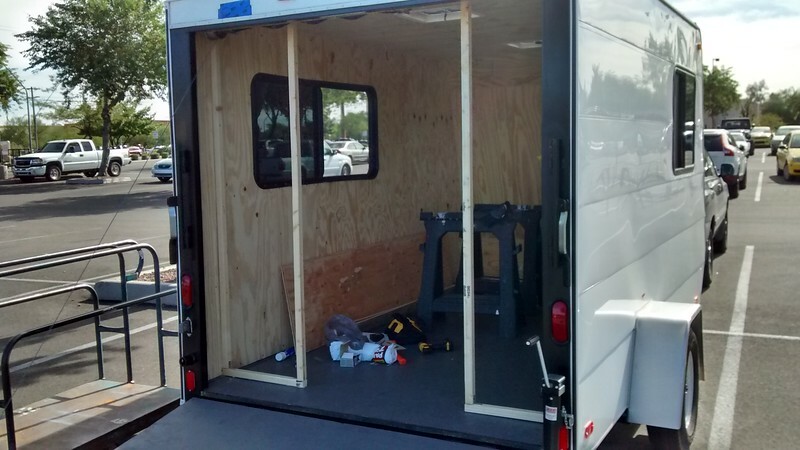 We ordered it with brakes, two roof vents (one with a 12vdc fan), aluminum rock guard and a drop axle for a lower deck height. 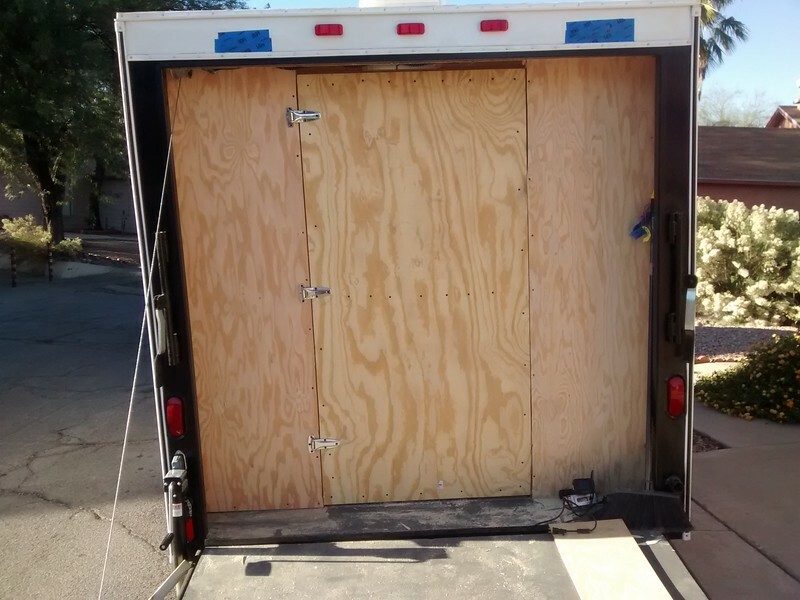 The trailer was built in California by Carson Trailers, and some of the initial fabrication was done by a local trailer repair shop. 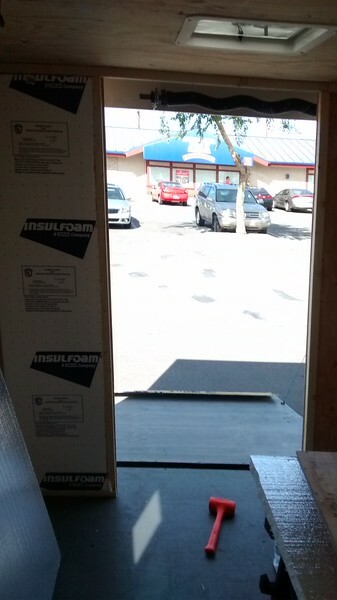 The fabriactor installed two windows, wall & ceiling insulation (1" poly-iso) and covered them with 3/8" plywood. 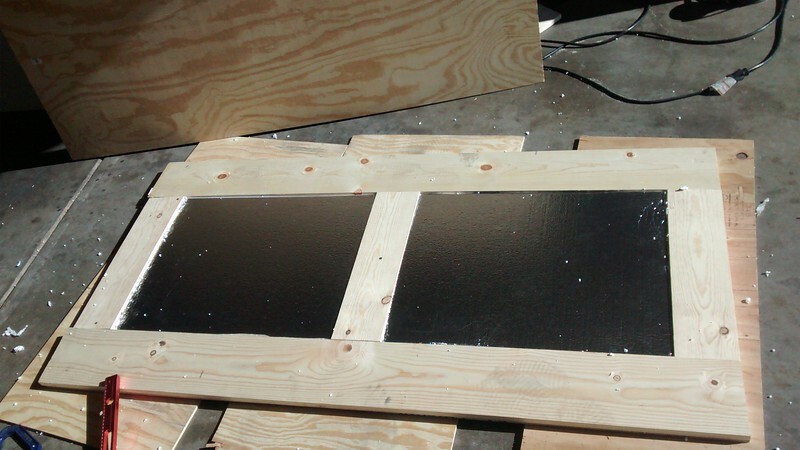 The above photo shows the window rough opening, ready for installation. The day we picked it up. The outside looks great! 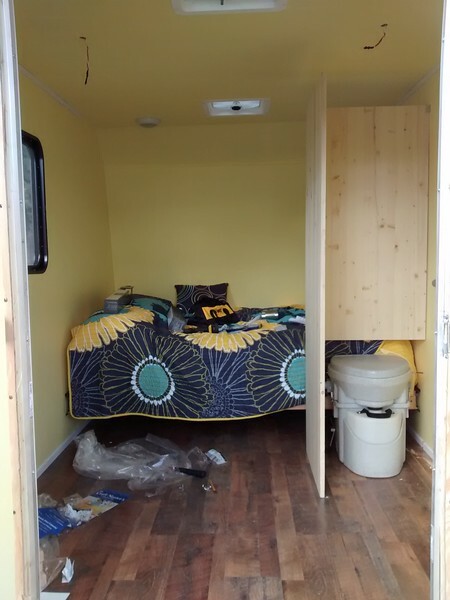 Lots of work left to do on the inside. 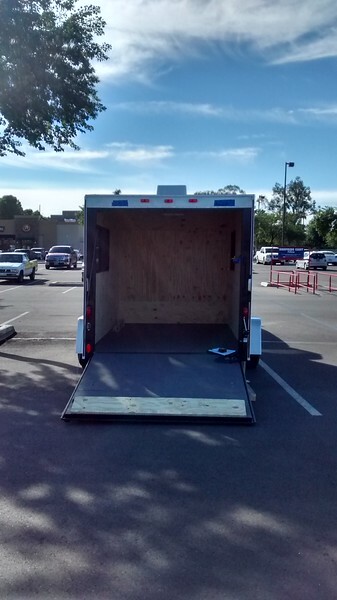 On my first free weekend, I picked up the trailer from the storage yard and parked in the "back 40" of a nearby Lowe's. The mission for the day was to build a rear wall. 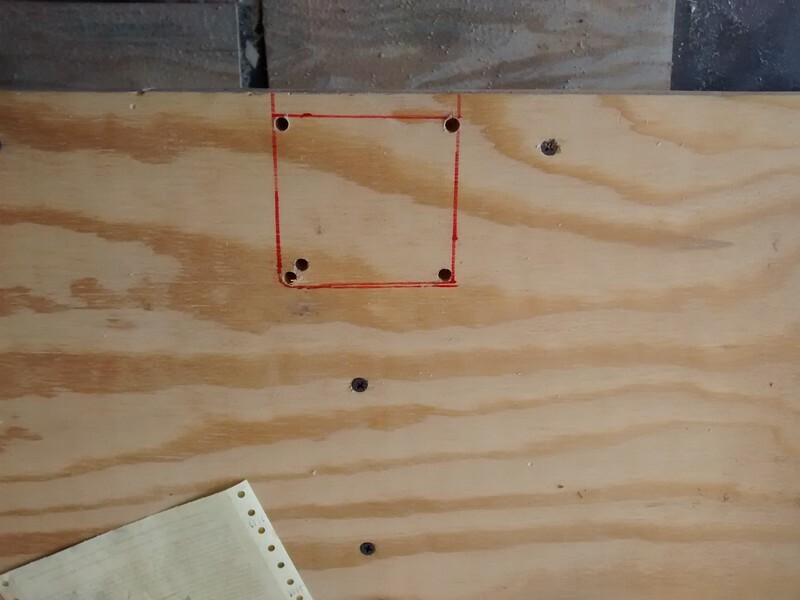 The rear wall will be constructed from 2"x2" framing and skinned with 3/8" plywood. And entrance door will be added later. 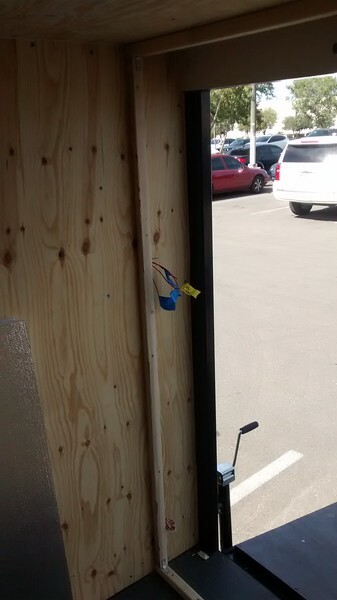 2 inch lumber, glued and screwed to the plywood wall, ceiling and floor. 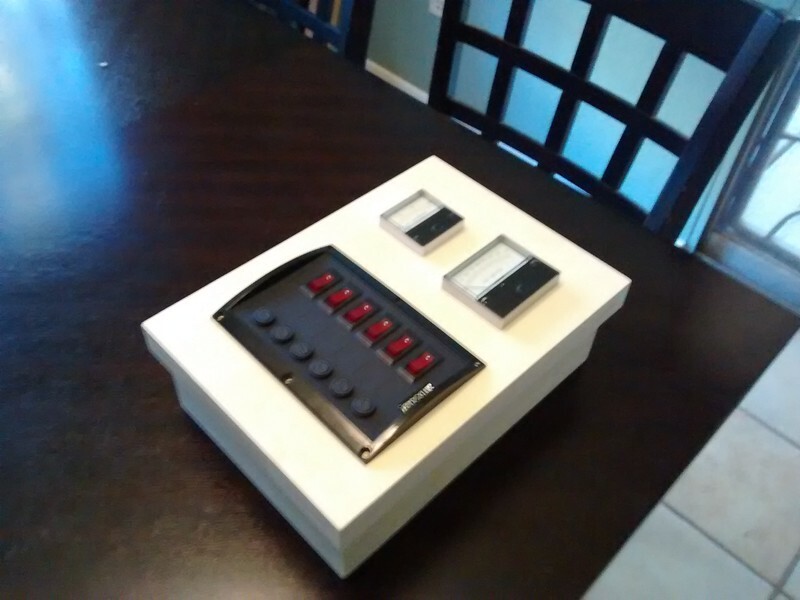 The wiring is for a battery and various light switches. The ramp assist is a coiled spring on a spindle. 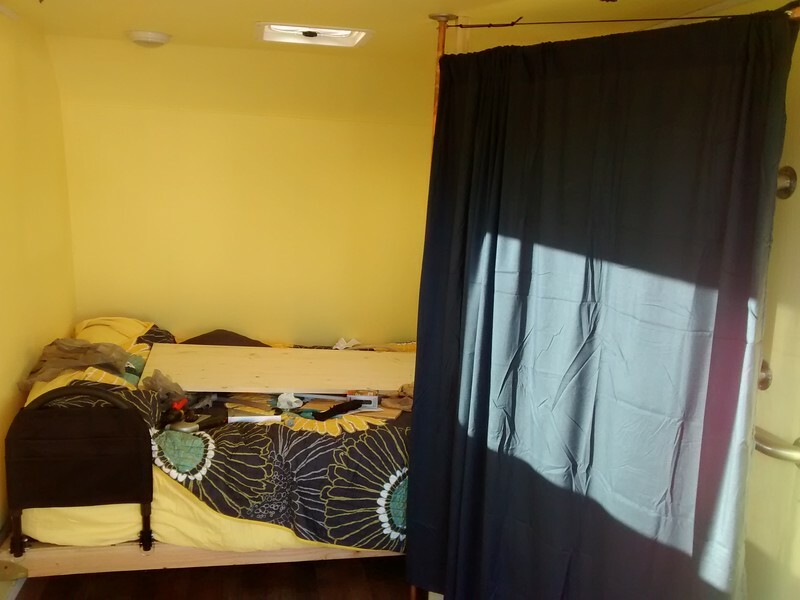 It's location means that the wall needs to be inset about 8". Outer walls done. Doing this work in the Lowe's parking lot was an excellent idea. I needed to run back in a few times for forgotten or wrong purchases, and each of those trips would have cost precious time..at least 1/2 hour each. Added bonuses is a wide selection of snacks, and an IHOP next door for "nutrition." 1 1/2" rigid insulation inside the wall cavity. 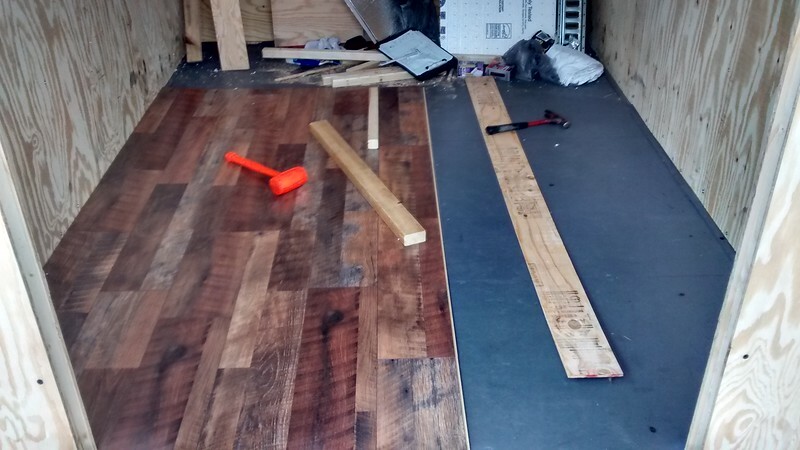 Pergo laminate flooring is pretty simple to install, and the results look great. 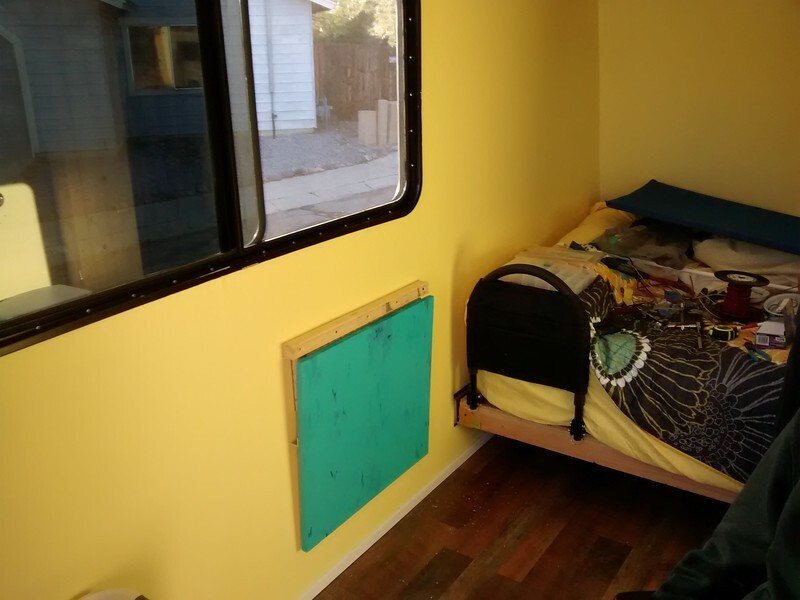 Flooring done, with a 5-star review. 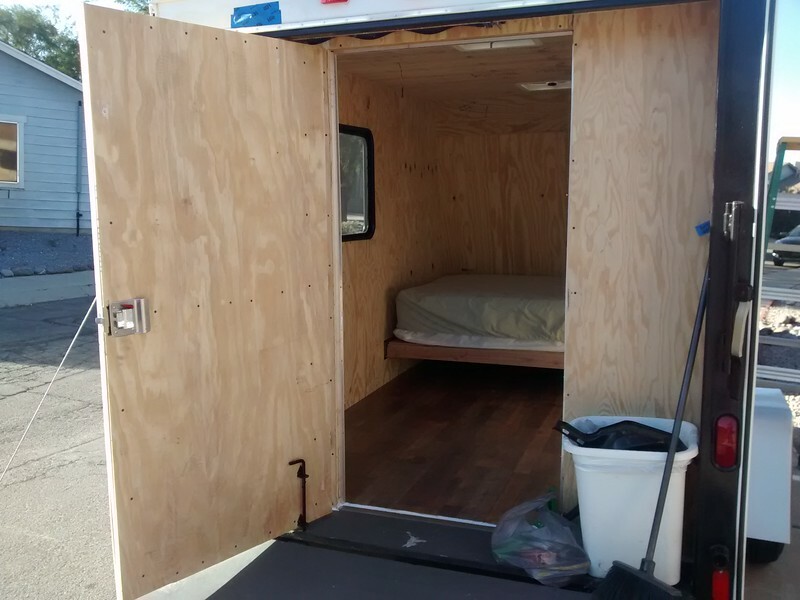 The full-size bed will be located at the forward end of the trailer, across the width. 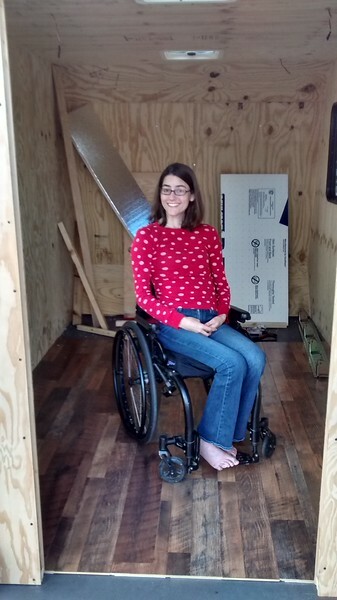 (This configuration allows enough room for wheelchair approach.) 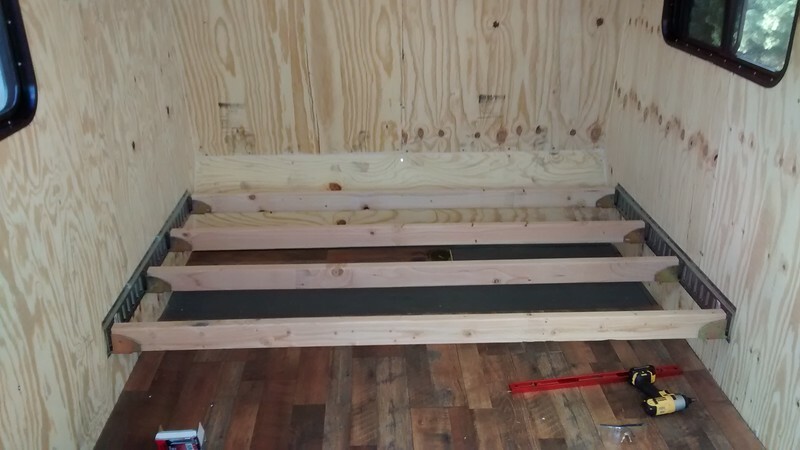 We screwed 4' lengths of e-track to the walls, using self-tapping metal screws where we could anchor to one of the vertical steel studs. 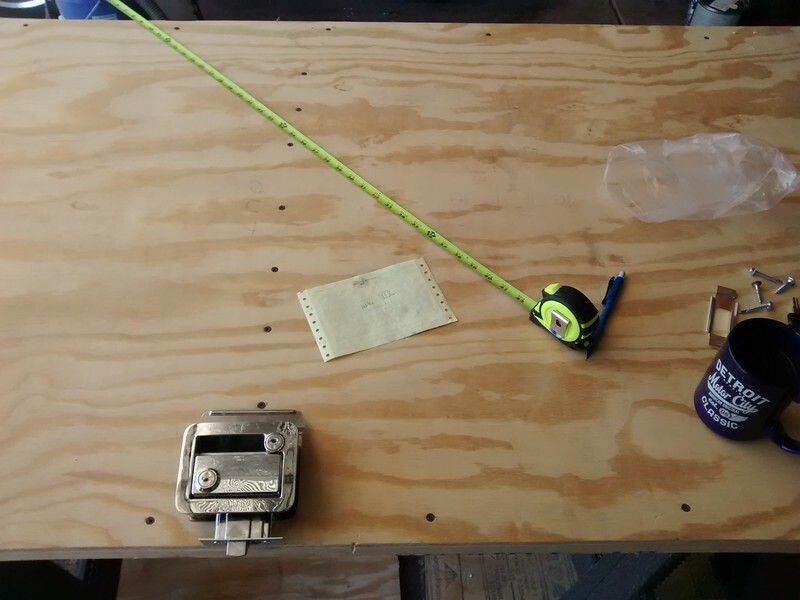 2" x 4" lumber was cut to length and attached using 2x4 sockets. 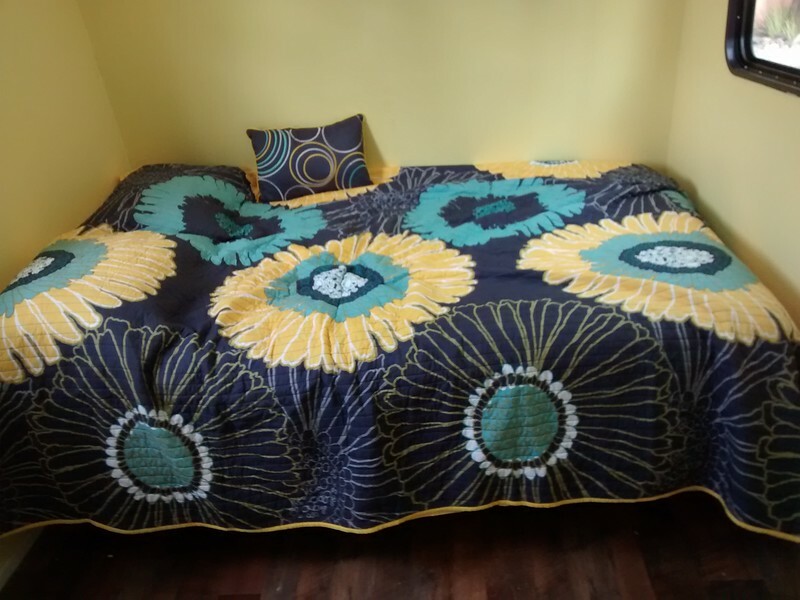 The completed frame shown above is only 4' wide, but a full-size bed is 54". We added supports to the side near the wall with 6" pieces of 2x4 (not shown here, I'll try to get a pic when I can.) 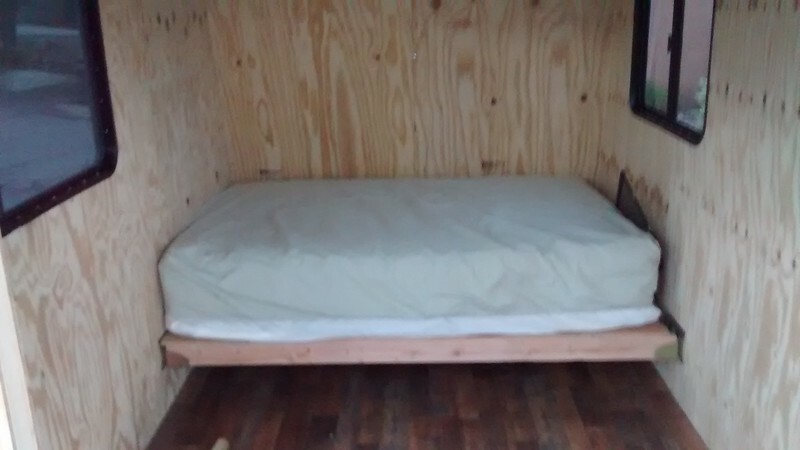 I don't plan on sleeping that close to the wall...it was mostly to keep the mattress from sagging. 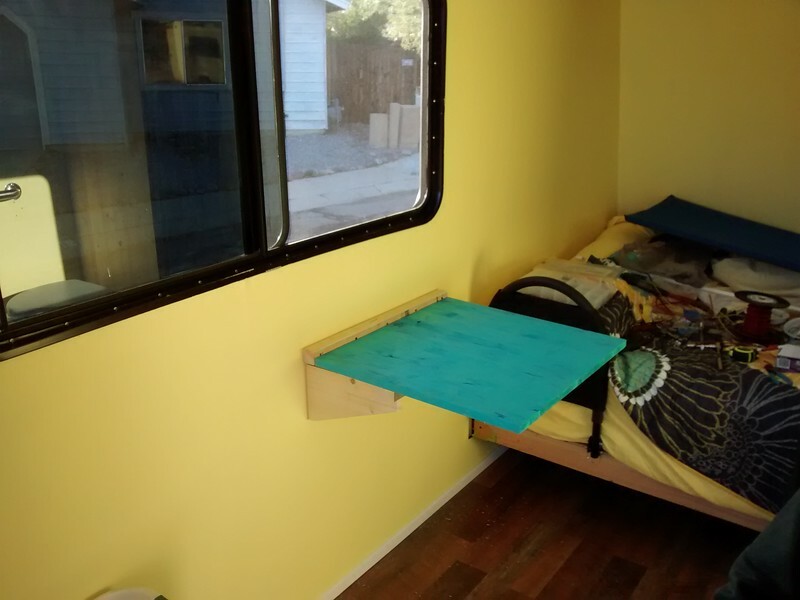 3/8" plywood covers the lumber frame, and a mattress gets thrown on top. 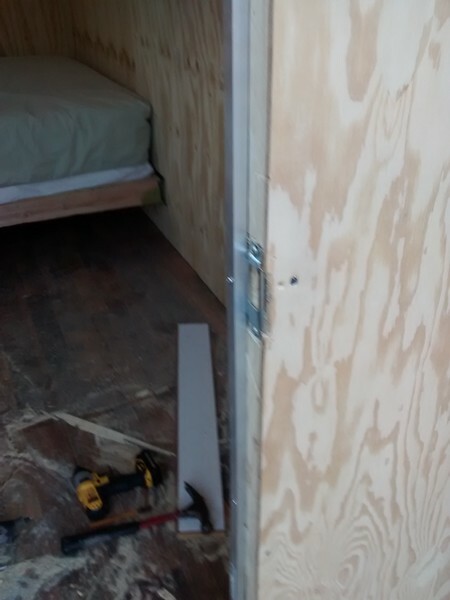 The door will be 3' wide by 6' tall. 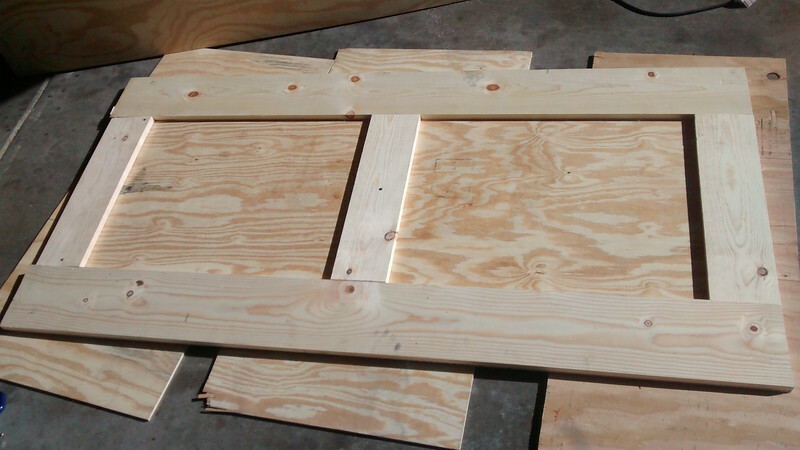 The outer skins will be 3/8" plywood, the interior frame made up of 1" x 8" boards for the verticals, 1" x 6" for the the horizontals. 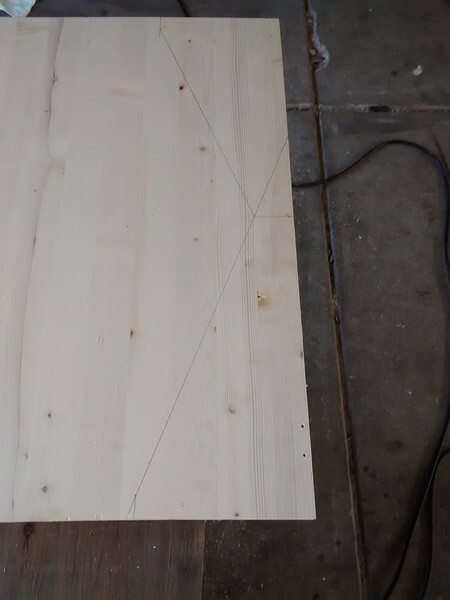 All wood is glued & screwed. 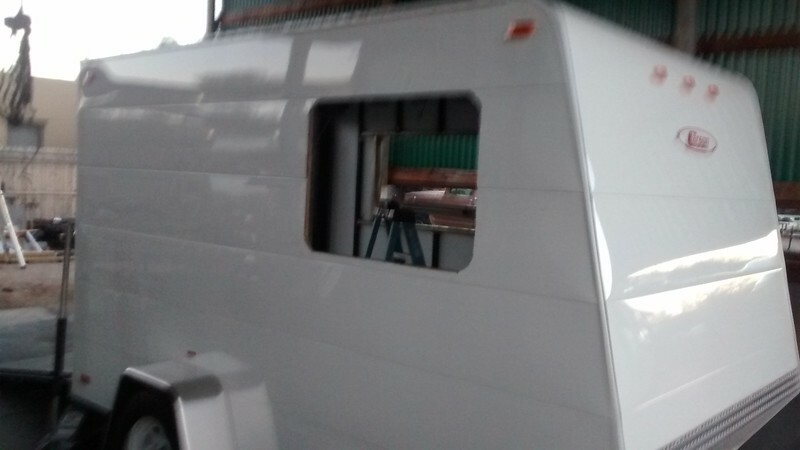 1/2" rigid foam insulation is added to the cavity, with the reflective side facing out. 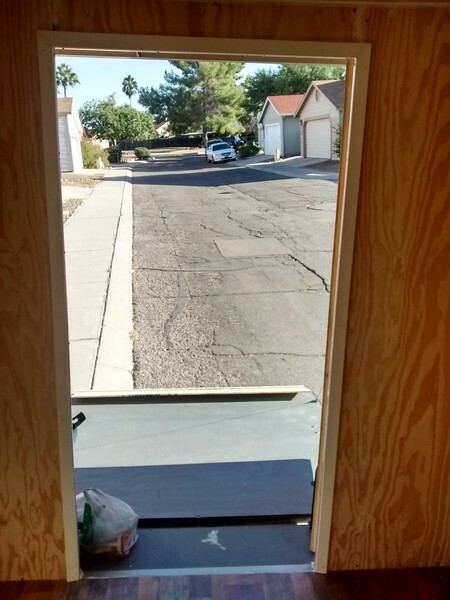 After many rounds of test-fit, trim, test-fit, trim...the door fits. The gap around the perimeter isn't very consistent,but it's a solid door and should serve. 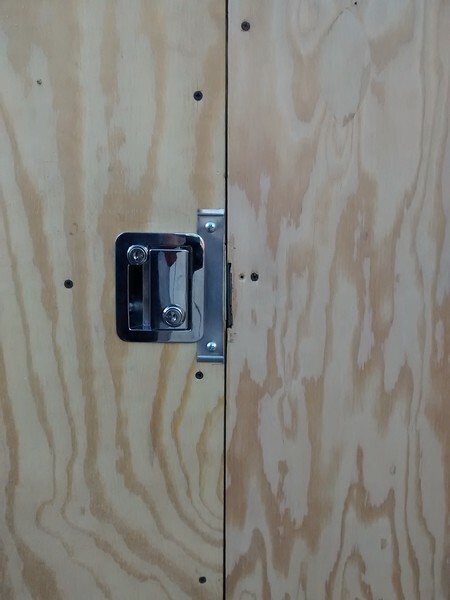 Installing the latch required a lot of small adjustments. Somehow I managed to draw my cutout too large. Measure twice...three times if needed! I'm sure there are specialized tools for installing latches. I don't have them. 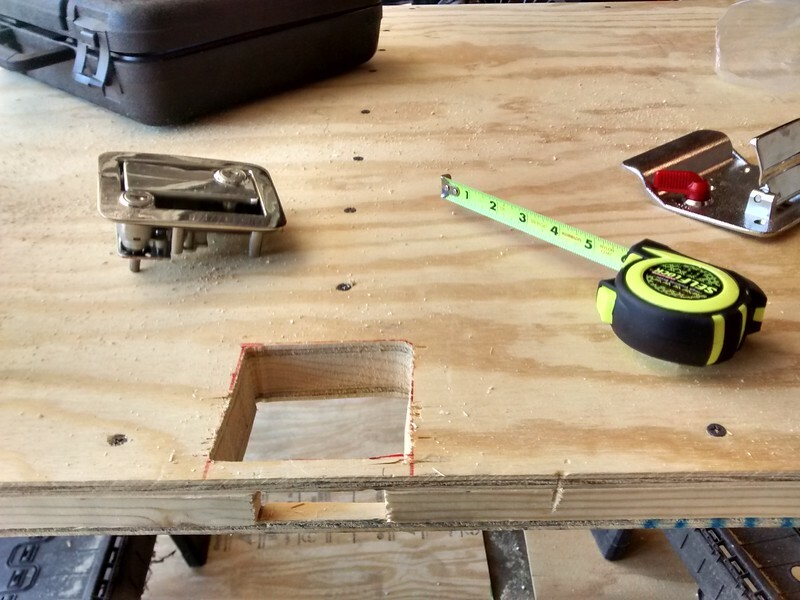 More hammer & chisel work to fit the strike plate. I used a strip of license plate to hide my oops. A gate cane bolt keeps the door in place. 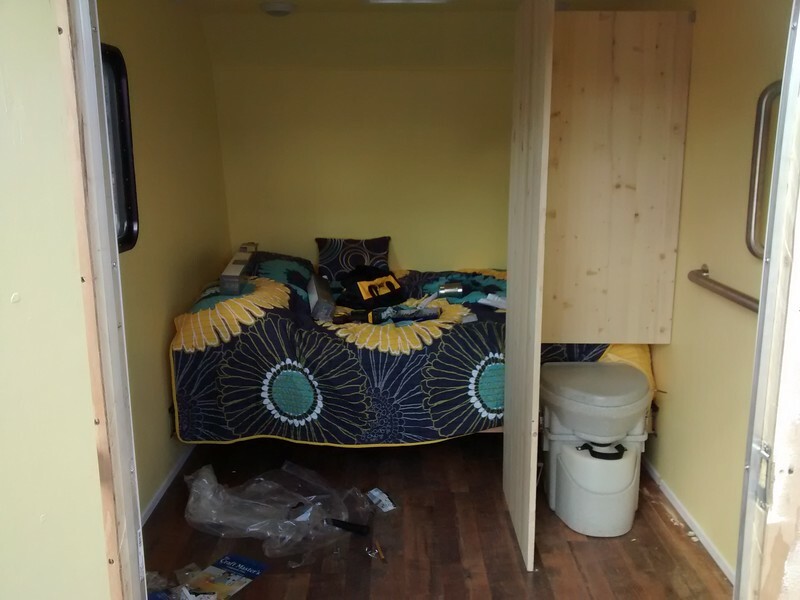 Simple casing around the doorway's interior spiffs it up for little cost. Prime with a little help from my friends. 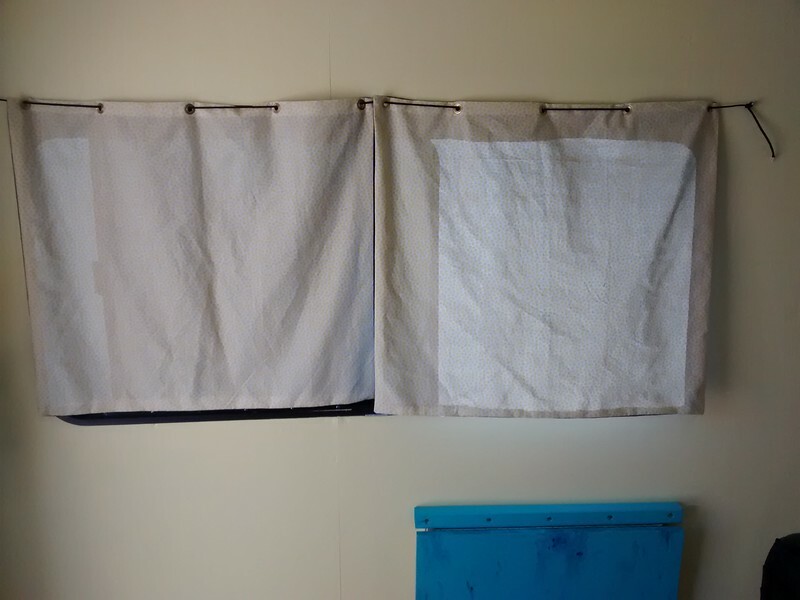 We went with two coats of high-hiding, water-based Zinsser to cover the knots. 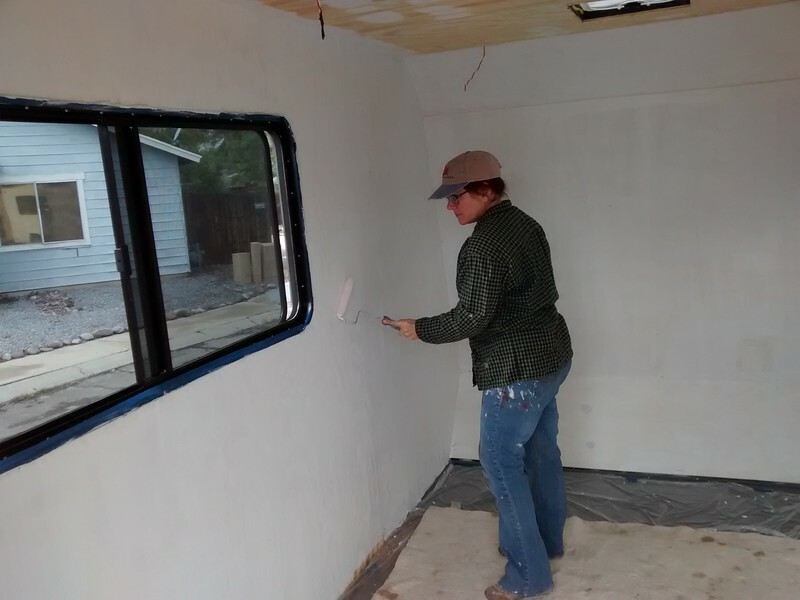 We also burned some time filling the cracks & holes with lightweight spackle. 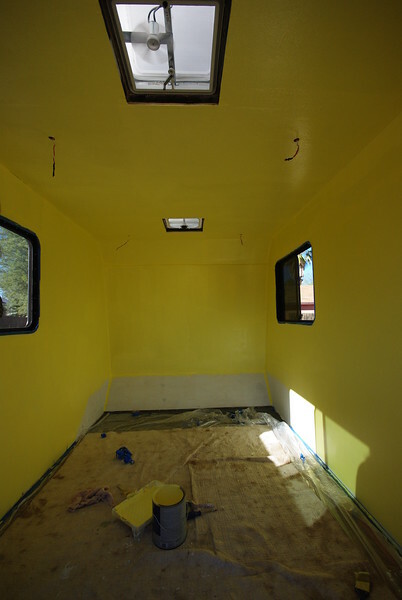 The color is Valspar's "Like Butter". 1 Gallon was just enough. 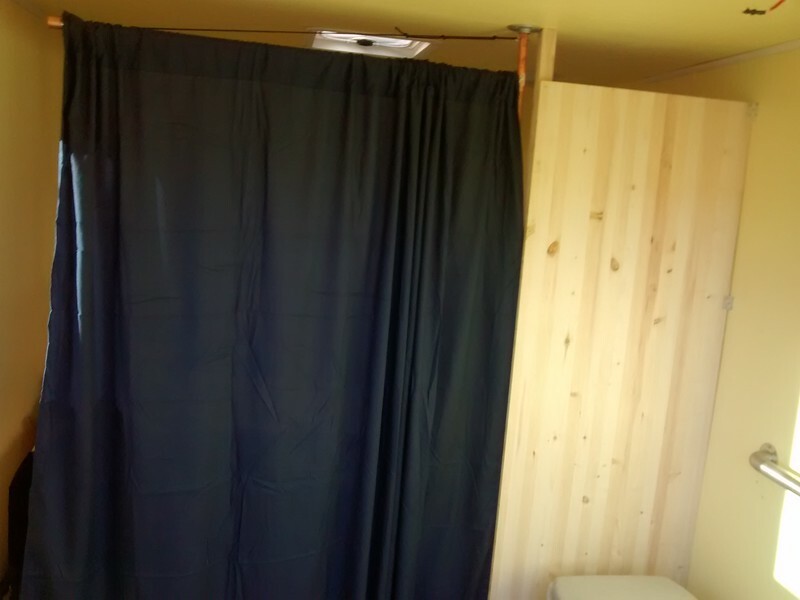 The small wall to the left of the toilet will be replaced with a moveable curtain. Stay tuned! 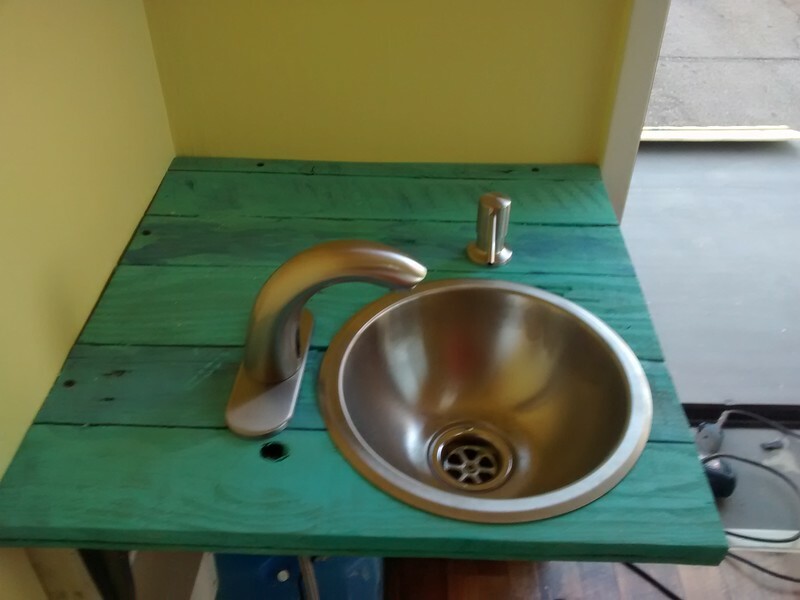 The sink platform was made from the pallet that carried the sidecar all the way from Kiev, Ukraine. 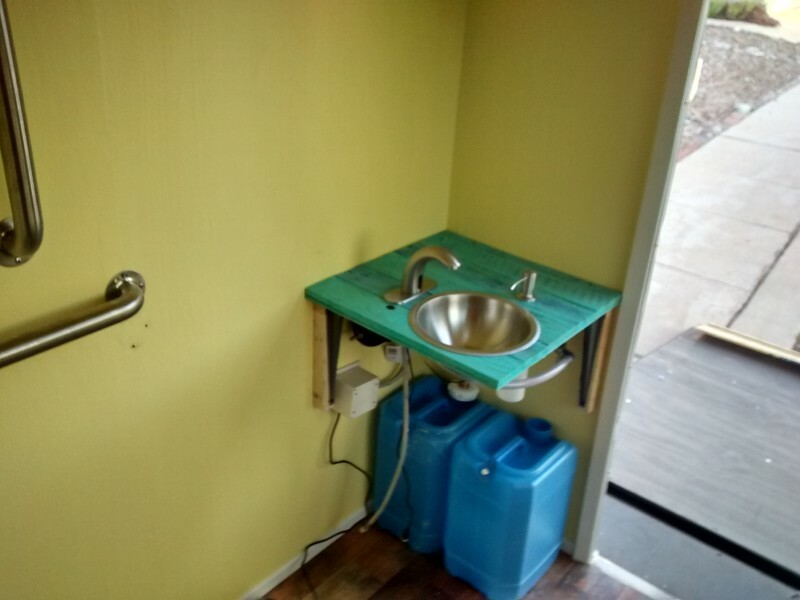 The faucet is a motion-sensing model. The fresh and waste water will be stored in gallon jugs. 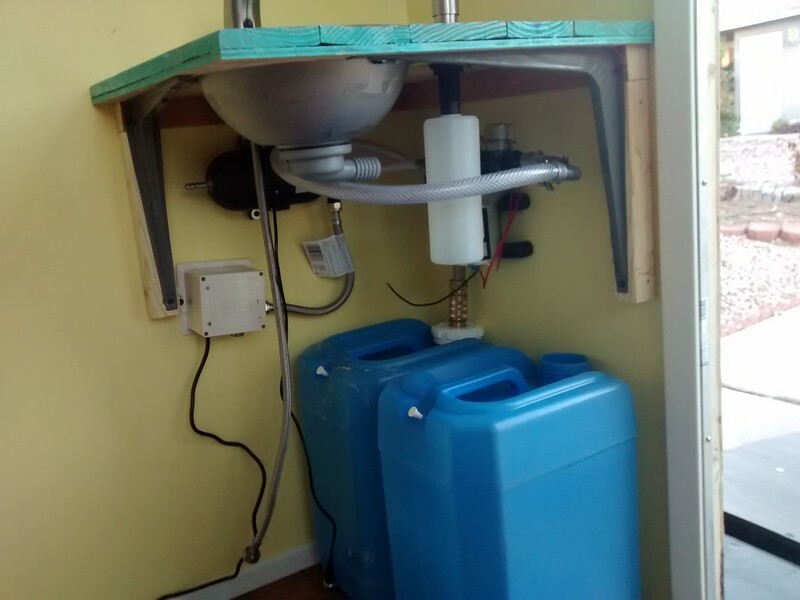 Pressurization is via a 12 volt Shurflo pump and accumulator tank. 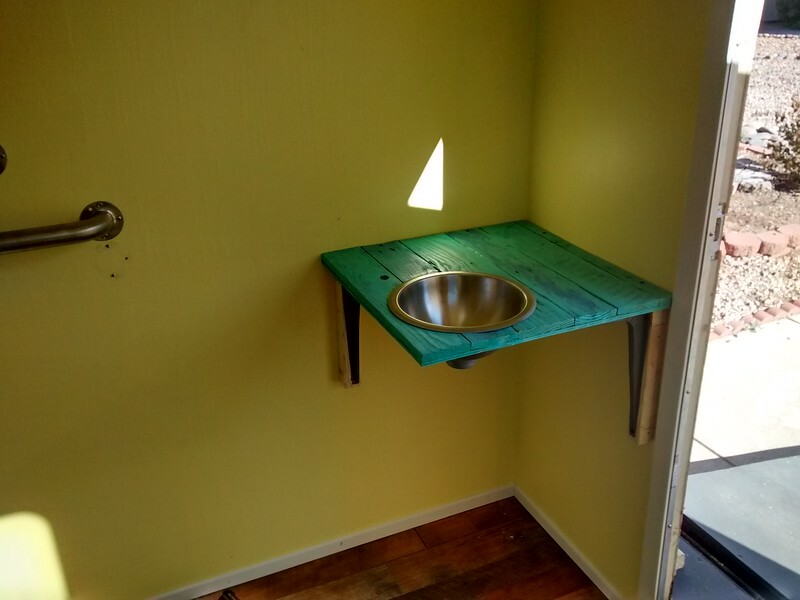 The limited wall space beneath the sink made for some strange hose routing. 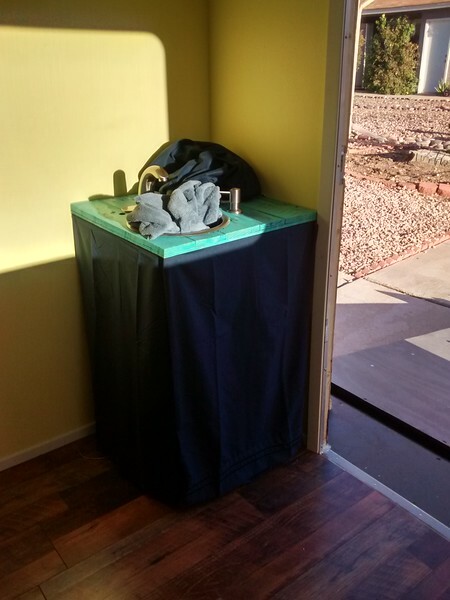 The far tank was initially set up with a quick-release attachment for garden hose, but the seal wasn't so great causing the pump to be unable to prime.